The Gantt Chart Creator for Excel is designed for those who need a quick and easy Gantt chart to present their project's progress. It can accommodate up to 25 project tasks and team members. Simply input the project's start and end dates followed by tasks and their individual start and end dates. The project can be up to one year long and each task can be between one week and one year long. If desired, assign a person or team to each task. The Gantt chart is created immediately. Print it out for your boss, investors or use it to run your own business or project. The entire Gantt Chart Creator process takes just a few minutes. 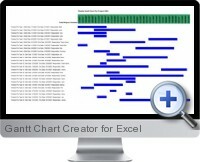 You must have Excel 5.0/95 or later to use the Gantt Chart Creator for Excel.